It is crucial for policymakers to assess the extent to which exchange rate movements will likely affect export performance. But this is the topic of an ongoing debate between macroeconomists and microeconomists. Studies by the former find these elasticities of exports to exchange rate changes to be rather small, if significant at all (Hooper et al. 2000, Bahmani-Oskooee and Ratha 2008). On the other hand, a more recent strand of literature taking a firm-level approach finds that these elasticities are rather substantial (Goldberg and Tracy 1999, Verhoogen 2008). Conceptually, the firm-level-based literature incorporates the well-recognised fact that firms are heterogeneous in terms of productivity (Bernard and Jensen 1995). There is not such a thing as a ‘representative’ average firm, surrounded by marginally better and worse firms, but rather, as Figure 1 shows, a vast majority of low productive firms (on the left side of the chart) and relatively few highly productive firms on the right side. Of those, only a few will be able to reach a level of productivity high enough to afford the costs (marketing, competition, etc.) associated with becoming an exporter (Melitz 2003). The conclusion of the above literature is that the trade impact of exchange rate movements varies substantially from firm to firm. From a sector/country perspective, this implies that the response to the exchange rate movements will depend on the underlying firm productivity distribution. More specifically, sectors that are more heterogeneous in terms of productivity will have lower trade elasticity to the exchange rate – as productivity has a lower zero bound, more heterogeneity implies a concentration of highly productive firms. In order to empirically test the hypothesis, in a recent paper (Demian and di Mauro 2017) we combine two datasets. First, we use the novel, firm-level-based CompNet database (Lopez-Garcia et al. 2015) related to productivity indicators and possible covariates for a large sample of EU countries. Second, we link this dataset with bilateral trade flow data from ComTrade. Critically, we run regressions explaining export performance with the higher moments of the productivity distribution – i.e. its dispersion, which we derive from the CompNet dataset. The inclusion of the productivity distribution in estimating export performance drastically affects the average elasticity, by doubling its value from 34% to 77% (see Table 1). It does so by reducing the unobserved bias. As Figure 2 shows, the mean-based elasticities are clustered around a narrow set of values, while the ones including the productivity dispersion are much more widely distributed (Kurtosis 2.9 vs 6.7). While we expect an exchange rate depreciation to boost exports and an appreciation to inhibit them, the two effects need not be the mirror image of each other. Key determinants of this ‘asymmetry’ are two rigidities: prices are rigid downwards, and quantities are rigid upwards. In the case of a currency appreciation, the firm faces barriers to increasing the quantity of goods exported which are less than those to increasing the price of goods exported. On the other hand, the firm is obviously limited in its ability to lower prices in the case of currency depreciation, but less limited in decreasing the quantity sold abroad. This leads us to believe that depreciations will have smaller effects than appreciations, as most exchange rate adjustments tend to happen on the quantity side (Bernard and Jensen 2004, Bugamelli and Infante 2003). To test this asymmetry hypothesis, we again run a number of regressions, including the dispersion of productivity as a critical covariate for export performance. The results confirm that exports appear to react mostly to appreciations rather than depreciations. More specifically, a 10% increase in the real effective exchange rate will decrease the value of exports by 10% (see the second row of Table 1). Meanwhile, currency depreciation will not have a noticeable effect on exports. Finally, we look at whether large exchange rate movements – both depreciations and appreciations – have a more pronounced effect than small ones. Our hypothesis follows the argument that if the exchange rate variation is small, so too will be the change in profits for the firm. In particular, as contracts are negotiated in advance and setting up a distribution network is costly, prices and quantities are sticky in the short term. Therefore, the firm may choose not to immediately adjust following an exchange rate fluctuation and may allow its mark-up to absorb some of the losses. Our empirical results, found in rows 4 and 5 of Table 1, confirm such a priori. Exchange rate movements (in both directions) matter more when they are relatively sizeable, as far as their impact on exports is concerned. To conclude, the underlying firm productivity distribution drastically alters the estimates of export elasticity to the exchange rate. In particular, a higher concentration of highly productive firms (thicker right tails) lowers the overall sensitivity of (sector/country) exports to exchange rate changes. These elasticities are also far from symmetric, as they differ quite substantially should the movement of the exchange rate be small or large, and depending on whether it relates to an appreciation or a depreciation. The results presented in this column have critical policy implications. 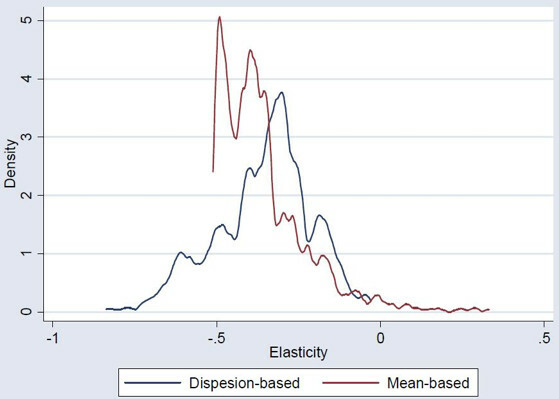 Since there is no such thing as a homogenous country-based trade elasticity to exchange rate movements, countries at the higher end of the productivity spectrum tend to record lower and less dispersed trade elasticities. Extrapolating this finding, countries that increase their aggregate productivity – for instance, via structural reforms which ‘thicken’ the right tail of the productivity distribution – would also experience smaller changes of their export results when the exchange rate moves, a development particularly desirable within the Eurozone, where exchange rate movements (in both directions) cannot be controlled at the national level. The research we have presented clearly indicates how the underlying firm productivity interacts with exchange rate exposure at the country and sector level – knowledge of that distribution via firm-level analysis is an additional critical tool for more solid policy design. Bahmani-Oskooee, M, and A Ratha (2008), “Exchange rate sensitivity of US bilateral trade flows”, Economic Systems 32(2): 129-141. Bernard, A B, and J B Jensen (2004), “Entry, expansion, and intensity in the US export boom, 1987–1992”, Review of International Economics 12(4): 662-675. Bugamelli, M, and L Infante (2003), “Sunk costs of exports” Banca d'Italia paper, vol. 469. Demian, C-V, and F di Mauro (2017), “The exchange rate, asymmetric shocks and asymmetric distributions”, International Economics. Goldberg, L, J Tracy, and S Aaronson (1999), “Exchange rates and employment instability: Evidence from matched CPS data”, The American Economic Review 89(2): 204-210. Hooper, P, K Johnson, and J R Marquez (2000), “Trade elasticities for the G-7 countries”, Princeton Studies in International Economics No. 87. Lopez-Garcia, P, F di Mauro, and the CompNet Task force (2015), “Assessing European competitiveness: the new CompNet microbased database”, ECB Working Paper No. 1761. Melitz, M J, and G I Ottaviano (2008), “Market size, trade, and productivity”, The Review of Economic Studies 75(1): 295-316. Verhoogen, E A (2008), “Trade, quality upgrading, and wage inequality in the Mexican manufacturing sector”, The Quarterly Journal of Economics 123(2): 489-530.